Rockport neighbors have offered insightful views, concerns and perspectives on a proposed project intended to improve Martin Road drainage. Skagit River System Cooperative (SRSC) submitted a “pre-approval” application on February 16, 2018, for funding a project to replace culverts on Martin Road. Richard has lived on Martin Road for eleven years. In his letter to SRSC Richard noted that, “the floods here have a significant impact on life.” He wrote, “…the lower floor of my house — goes underwater when floodwaters rise above 32′, causing a lot of nuisance and some damage. I understand that enlarging the culverts in question would significantly improve the drainage around my house during floods, thereby reducing the challenge of living here… as well as opening the slough for baby salmon to access. “We are writing to express our interest and limited support for the project to address the culverts and drainage issues on Martin Road in Rockport WA. “I have been farming on land owned by Lois Canright since 1979. This is a commercial operation and has been a certified organic farm since 1981. This is my primary livelihood, and I regularly employ between 5 and 6 full time seasonal farm workers. Due to our rainfall, I am rarely first to plant in the spring, and again, I adjust my cropping strategies to work with in the constraints of the site. My biggest challenge is cultivating land in the spring. If the water doesn’t drain, it takes quite a long time for the soil to dry adequately for me to prepare the land for planting. Because this land can flood in the fall and winter, I have focused my cropping programs and strategies to have largely completed harvest by mid-October so I have sufficient time to establish a diverse cover crops on the land to protect the soil from flowing flood waters. “A previous land owner installed culvert #4, and for many years, we have been working to keep culvert no. 4 open and flowing. It requires constant vigilance to prevent the beavers from occluding that culvert. Over the last several years, it has become clear that the blockages at #2 and #3 are now providing the biggest barriers to adequate drainage on the farm as well as fish access to upriver riparian areas. #2 has been a growing problem due to increasing infill of Reed Canary grass and invasive iris. That culvert really needs the first attention. At the rate of channel migration, the Martin Road may well be eroded in the future, but it may actually be a long time that culvert #2 will continue to prevent fish from accessing the upriver riparian region. This culvert needs to be improved or fitted with technology to prevent the beavers and invasive plants from plugging the culvert. I don’t believe it makes financial or biological sense to clear the other culverts, at least for fish passage, until number 2 is cleared and maintained. -b- perhaps drain too quickly forming a sluice which could cause excessive erosion at the low point where the flooding Skagit first enters that slough, which is between culvert #3 and #4. 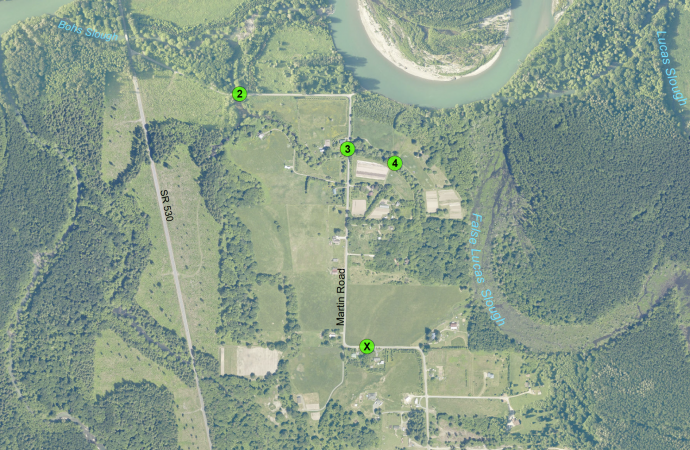 “It would be helpful to have a better understanding of the elevations between Russ Dalton’s’ property, and culverts #4, #3 and #2 to understand where the outflow gradient wants to be. “I am writing to support the Barnaby Reach Early Action Projects proposal to the Floodplains by Design program submitted by the Skagit River System Cooperative (SRSC) and partners The Nature Conservancy, Seattle City Light, the Washington State Department of Fish and Wildlife, and Skagit County. I understand that if funded these projects will increase flood resiliency for the South Rockport community and provide benefits to fish and wildlife. And, this certainly will help build trust between the community and agencies that will be essential for pursuing the proposed Barnaby Reach project and other projects in the future. I have lived on Martin Road with my wife in the project reach for 26 years and serve as one of three landowner advisers on the Stakeholder Advisory Group for the Barnaby project. During this time we have lived through several large floods (including in 1995, 1999, 2003, 2006, and 2017) and have personally witnessed how floods affect valley residents. The projects in this proposal will increase safety in the community by supporting driving access across a larger range of flows and allowing standing water to drain more rapidly after floods. There was a community meeting on February 6th attended by eleven residents in the Martin Road area and many voiced their support for these projects. We have all been called upon to aid others in our neighborhood during these floods; five of the attendees are volunteers with the Rockport Fire Department, District 19, and bore witness to making safer the entry and egress of a flood-filled Martin Road area. • Culvert 3 adjacent to the McGown/Crozier property. Ideally Culvert 2 at the downstream end of Martin Slough would be corrected as well to provide total access for fish. However, until that time I support any work that might be done on Culvert 3, with the caveat that hydrologic studies be done to insure that it would not create scouring or accelerated flow that might threaten the McGown/Crozier home and to some extent the Canright fields. • Culvert 4 on the Canright property. I support the conversion of this culvert to a bridge but respect Lois Canright’s reservation about work on 4 creating possible increase of flow from the Skagit into the Martin Slough. And, I urge hydrologic studies prior to any work on Culvert 4 to address these concerns. 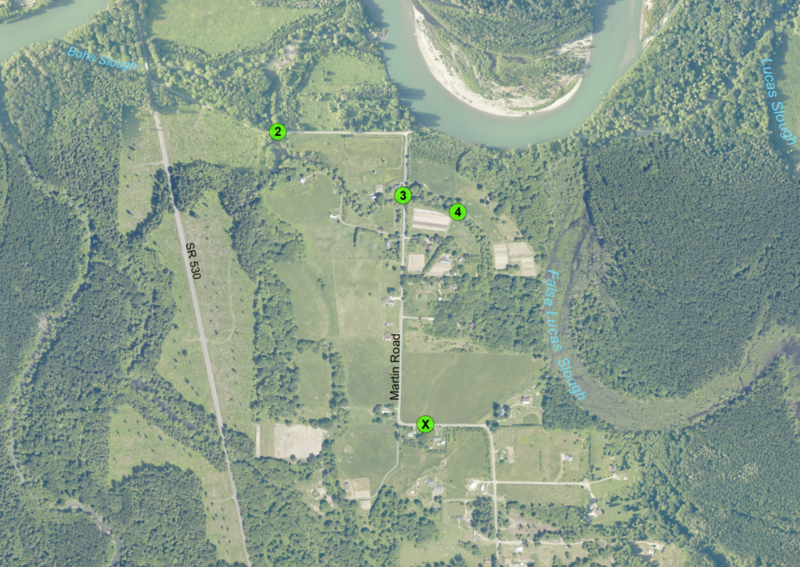 • The dip in Martin Road: Raising the grade and possibly adding culvert(s) to Martin Road adjacent to the south side of the Board property. I urge and fully support raising the grade so as to allow entrance or egress during a flood event, both for residents and EMS vehicles. If a culvert is used, the culvert would need to be laid at the present level of the current road. This would maintain the current flow of water that goes over the dipped road (and not increase flooding for a neighbor if a culvert was placed lower that the current dipped road).